Life List Item #35: Compete With My Dog in Agility. Check! Given how much yammering I have done on the subject, I know I should write a ginormous, detailed post about Shiva’s first agility trial. Strangely, I don’t feel like I really have much to say about it. We showed up! And, um, that’s pretty much it. You mean we actually have to run a course too? It was a very, very long day. Before now, I didn’t realize just how long these things go on. But with four courses and three classes in each, the setting up takes forever and the actual running of each dog takes even longer. We arrived on the site around seven in the morning and didn’t leave until after four. That’s a full day’s work for a dog with focus problems. Every participant is required to volunteer so I was kept pretty busy most of the time. Remembering where to set the bars for each jump height took up quite a few brain cells! 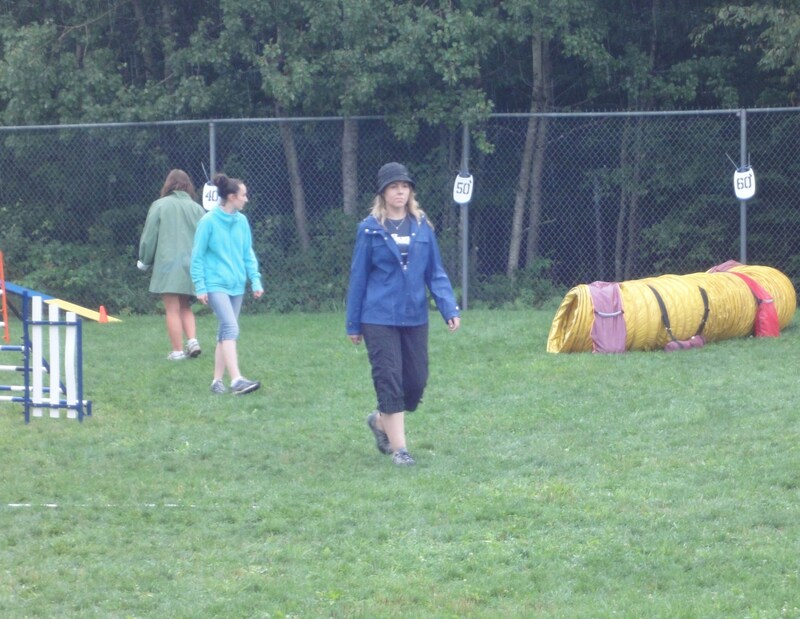 Dog agility, it’s not for the slow-witted. Luckily, my PH was on hand to keep the Shiva happily occupied with treats and toys. She is definitely a two person dog. I don’t know how people do this alone. Taken with my camera: I couldn’t resist. All they needed was a beer. I took almost no decent photos. It was either raining or I was too busy looking for leashes for the Masters-level dogs to even think about grabbing my camera. Most of the ones I am showing here were taken by a friend who has a fantastic camera and was kind enough to share them. Please don’t knock any bars! I have no idea what 12 inches is! I am Canadian, dang it! Considering this was my first trial experience in anything and my expectations were non-existent, I guess I am satisfied. I am glad we went, at any rate. 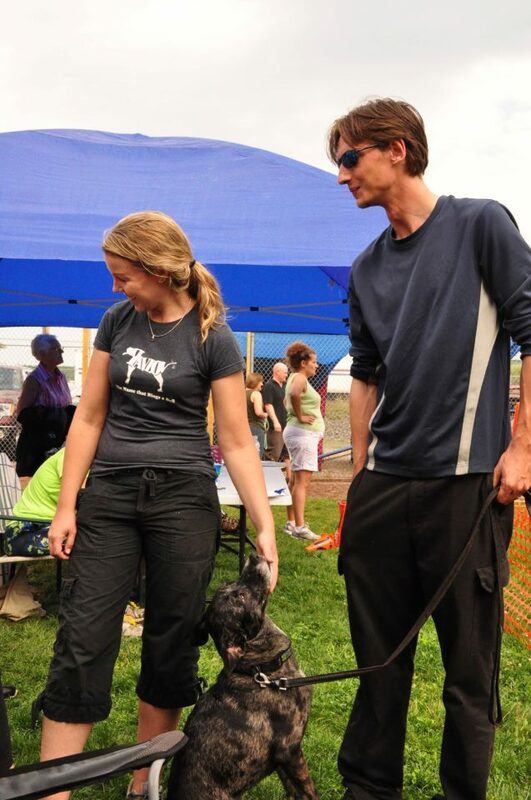 It was fun to cheer on our friends and watch the other dogs with their unique quirks. Shiva didn’t have a single moment of reactivity and she was in an environment that would ordinarily cause her anxiety. All that waiting around usually makes a very stressed out puppy. But she was all smiles and wagging tails even by the end. That was a lovely surprise. I am not sure when we will sign up for another. There is a fun match in September that we’ll probably attend but after that remains uncertain. There is no rush, as far as I am concerned. Shiva isn’t running out of energy any time soon! Now that I know what to expect I can be a lot more strategic about training and planning. One of few pictures taken with my camera. How confused do I look walking my first course? We are never going to be a team who hits up every event in the province. Agility is a fun hobby for me, not a career. If we never do more than one jump a few times a year, I can learn to be okay with that. Thanks again to everyone for their encouragement and support. We may not have done anything noteworthy out there but we’ve worked hard to get even this far. I wouldn’t have shown up without you. Special thanks to the photographer for capturing a wicked shot of Shiva jumping and to Mufaasa for his post-run hugs. I’M SUPER DUPER PROUD OF YOU!!!!!!!! Go Shiva!!!!! Go Kristine!!! I know how tentative you were about this and how you fretted, I’m really so proud that you did it and I hope that, although you were busy, you had fun with your dog. It sounds like Shiva did amazing in that environment and handled it with grace! Nothing Noteworthy?! YOU DID IT! The whole thing is noteworthy! And Shiva was happy and sane and non-reactive! YAY SHiva! As far as I am concerned, I thin kyou guys ROCK! That is so amazing, way to stick with it! Look at that last picture and tell me again nothing noteworthy happened!!! This is soooo awesome. And just ftr, that whole not reacting badly bit? This reactive dog owner would give her left arm to having that be nothing noteworthy! Congratulations, Kristine and Shiva. You ROCK! What’s that saying again? 90% of being successful at life is about just showing up? You showed up! You competed with your dog! You volunteered! I’d say that all those things are pretty noteworthy. WOOHOOOO! Today was my first day of school and I was feeling wiped, but reading this post turned my whole day around. So excited for you! Congrats! Now I have a big grin on my face and a second wind, so thank you 🙂 And how great is that last photo? Totally frame-worthy. What a major milestone for both of you! I love that Shiva surprised you by being as relaxed as she was and sounds like she just enjoyed hanging out – love that pic of her in the chair! Thanks for sharing your experiences and the pictures. 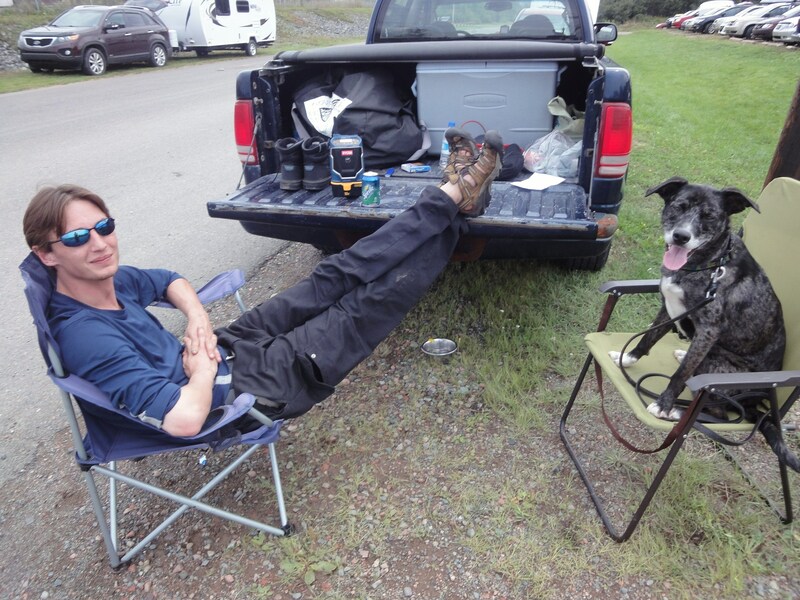 You haven’t inspired us to do agility, but we do love reading about you and the mighty Shiva as you go about conquering the dog world. Or deciding that you really don’t need to. It looks pretty noteworthy from here. Congrats! The first trial. I remember. Small moments of brilliance followed by Dog? Dog! DOG! Get back here! Yeah. But I got hooked bad. Your ‘high point’ photo? I’d frame that. It’s lovely. Congrats on your first trial! Woot! Woot! The first big scary step is done. over. Under your belt. And you are still alive. High Five! Yay! Good for you both. It sounds like you were kept too busy to even think about slipping away. And the PH did a great job keeping Shiva happy. Big high fives to Team Shiva! Oh yes, I would definitely frame the last shot. It always amazes me how we all give ourselves such little credit for the incredible things we accomplish. I would say to you that you took a dog that used to be incredibly reactive, took her to a place full of dogs that would be the perfect place for a reaction and yet you got none. And you say that IS NOT NEWSWORTHY. I would disagree with you my friend, that right there was AMAZING. You should be patting yourself and Shiva on the back. Job well done Kristine. Very well done. You did so great! You should be super proud of yourself. If I can get Mufaasa that far on course on our first day I’ll be thrilled! A bunch of us were watching you as you watched the course and commenting to each other how you were standing by the ring looking like a rock-star. You handled yourself well and you handled Shiva extraordinarily well. And Mufaasa is always ready to give post run hugs (I might be needing a few myself at the end of next month!). Oh!!!!!!! I am very emotional lately and you brought tears to my eyes! Happy tears of course! I’m so happy for you! Happy that you went out there and did it! It doesn’t matter if you placed, you got much more than that! You got confidence that you and Shiva can do this, at your pace! Whenever you are having doubts you can look back on this day! Oh and you looked totally adorable doing it! 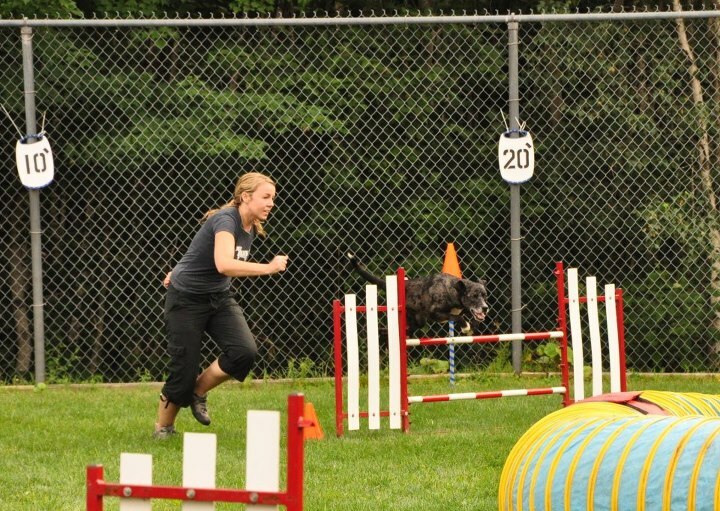 I went to a boring WordPress conference and you guys rocked it in an agility trial!!! YAY!!! You really DO look adorable in all of those pictures (and so does your PH and Shiva!!) Congrats !! Woo hoo! I completely agree with Jodi, the fact that Shiva was happy all day is amazing! All of the pictures are great, that last picture should definitely be enlarged and framed. You guys rock! Well done to you and Shiva. It takes a lot of guts to step into that ring. WhooHoo! How awesome to finally let go of your fears and give it a shot. Shiva literally took that first leap with you. Go Team Shiva! There is a lot to love about this post. First, Shiva was calm and happy. Second, you did what you set out to do and were happy with the results. Third, looks like a cute friend in Mufassa. and Fourth, awesome action shot jumping over the bar! I like your attitude, because it is so in tune to Shiva’s emotions. Oh, and 12 inches is about …this (holding hands apart) far! Way to go, guys!! It’s so great that you broke through and did your first event. They can only get easier from here – if you even decide to do anymore. At least you did it once – no one can ever take that away from you! 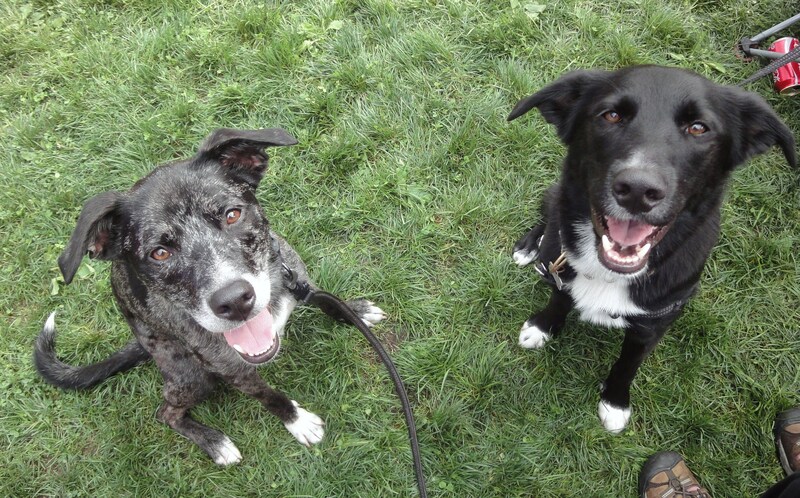 BTW – that picture of Shiva and Mufassa is way too cute! So glad y’all got to go! 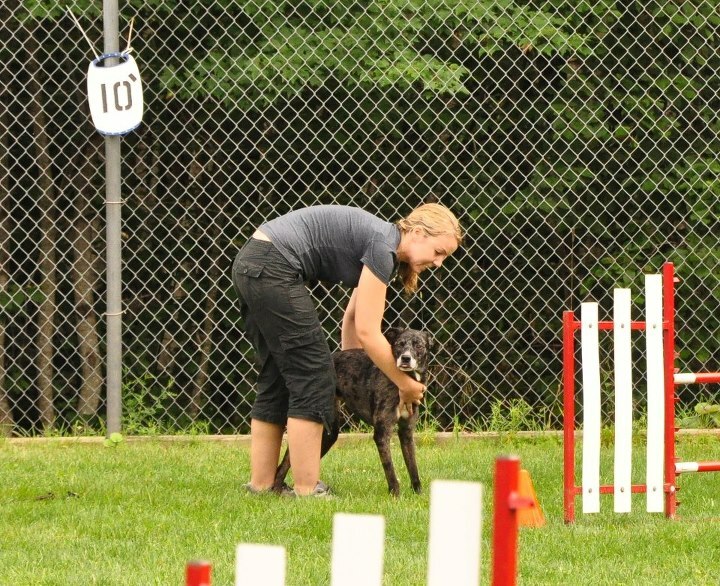 I am living vicariously through you…Riley can’t do agility because of her hips and knees. When I first got her, I really wanted to do agility with her and was crushed when I found out she has bum legs. Seems like a fun thing to do! That last shot really tells the story, love it! So glad you guys made it through – the important thing is that you set a goal, and reached it! A day like that would wear me out too. So glad Shiva did so well and made friends too! Whew! That IS a long day! I am so happy you did it, even if it was a long day. 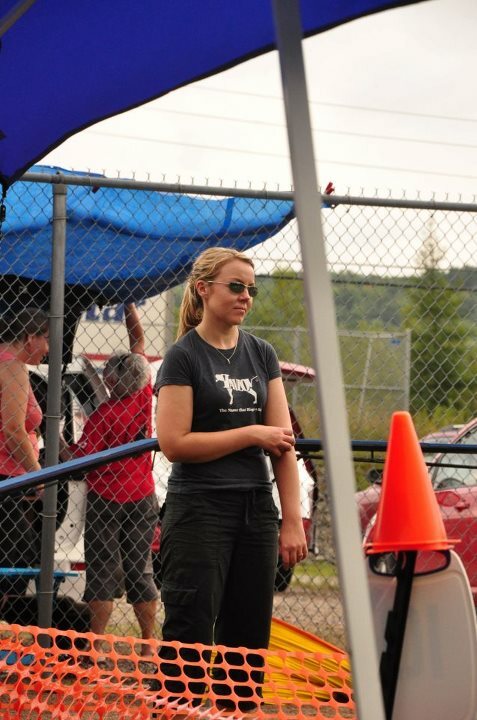 You know I attended my first agility trial earlier this summer and I was struck by how busy the agility competitors were too! I had no idea that everyone took tuns helping with set up and take down. I am so glad your friend got such great pics. There were some great ones of Shiva, but I absolutely love the one with her and Mufassa. What adorable dogs they are! Kudos to you and Shiva! BTW – one of the reasons I have chosen not to do agility is the time commitment. I would feel so guilty spending all that time with one dog while my other two sat at home all day. Herding I can do twice a month, have fun and still feel like I am not shortchanging the girls.